Climb aboard and let our guides share with you the history of our town as you ride through historic neighborhoods and past historic sites and landmarks. You'll see homes that housed former influential members of the community, including civic leaders, merchants, and doctors; teachers and principals of the first public high school in the state, right here in Cary; and the woman who made Cary the “gourd capital of the world!” You'll also see historic churches and theaters and old general stores, and visit cemeteries with graves dating back to the 1800s. Did you know Cary has an extensive African American community with a long history? You'll learn about that too. And you'll discover one of our most distinguished residents who served as the U.S. Ambassador to Great Britain under President Woodrow Wilson during WWI. 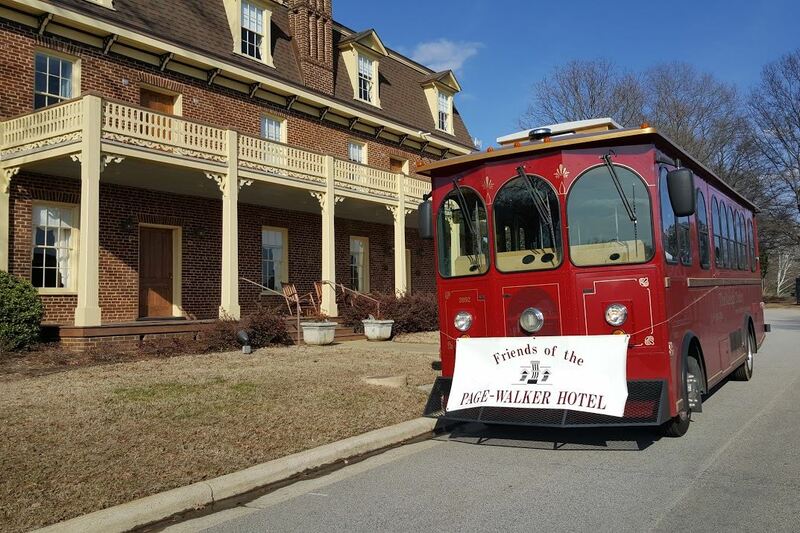 At the end of the trolley ride, step inside the Page-Walker Arts & History Center and let our volunteers show you around the building, once an historic railroad hotel. Or take a self-guided tour with our brochure. The Friends offer two trolley tours a year, but due to demand, we're offering a third tour on June 30, 2019. Tickets will be on sale starting May 1. Check back here then for information on how to purchase tickets. Private tours are available for groups of 20 or more. If your group or organization is interested in a private trolley tour, contact carytrolley@gmail.com. Click here for a printable version of a Private Group Tour information flyer.